These chunks of fossilized coral keep us enchanted—and endlessly searching. If you’re from Michigan, you understand the lure of the Petoskey stone. This article is featured in the August 2017 issue of Traverse, Northern Michigan’s Magazine. Get your copy. When rock hunting along Lake Michigan’s shoreline for Petoskey stones, it’s best to get the fossilized coral wet to better see the pattern. One easy way to wet them is to lick them. Mary Jean Brick knew that, and her grandkids knew it too, because she took them Petoskey stone hunting with her. The grandkids will tell you that initially it was repulsive seeing Grandma licking stones. After years of having their parents tell them not to put things into their mouths, particularly things lying on the ground, they could not believe this white-haired woman was picking up stones and licking them. But then, it became a sort of boundary-crossing thing to do, encouraged by the wisest person they knew. As a result, the grandkids all fell in love with rock hounding for Petoskey stones. When my friend Tim Brick told me this story, he got me curious about the stone, because we have nothing like it in Pennsylvania, where I live. He sent me to Kevin Gauthier, and his gem and jewelry store, Korner Gem, in Traverse City, to learn about the cherished fossils. 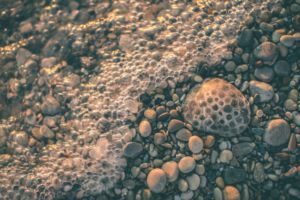 Petoskey stones were created about 400 million years ago and are deposits from the ancient rugose coral, Hexagonaria percarinata, which grew in seas where Michigan now sits. Over the course of eons the coral became embedded in limestone bedrock, and during the Ice Age, miles-high sheets of ice busted up the bedrock, and the ice’s movement ground off the rough edges of the chunks of fossilized coral. Other rocks found here—primarily quartz and granite, but also many others—came from Canada and the Arctic, thousands of miles north. The glaciers acted as a large conveyor belt that moved rocks here. The upshot for Michigan rock lovers is the state has not just great Petoskey stone picking, but also the largest variety of rocks of anywhere in the world. Petoskeys are named after a Native American chief, Pet-o-sega, and translated Petoskey means “rays of the rising sun” or “sunbeams of promise.” Lapidary polishing techniques will bring out the stones’ characteristic “eyes,” which are the diameter of a pencil, and have a six-sided coral pattern. Kevin Gauthier, like my friend Tim Brick, was also fascinated with hunting Petoskey stones as a young boy. He was a 12-year-old surfer dude, and when there was a lull in the waves, he lay on his board and searched for stones, aided by the slight magnification of his scuba mask. Gauthier collected so many Petoskeys, he filled a shoebox every week. His mother gave him the ultimatum, “Get rid of them or do something with them,” and a gemologist was born. His mother jumpstarted his career, and then his father created new pieces of rock cutting equipment for his son out of what appeared to be junk parts. From there, Kevin began making little rock critters he called “oogies,” with googly eyes and a glued-on peacock feather on its back. He sold hundreds of them at his father’s shoe store. His oogies evolved into pendants, which he made by gluing jewelry components on the top and of these, he sold thousands. With his hard-earned money, this teen purchased his first real rock saw and grinder, which propelled him into the rock world. He made the announcement, “I wanna go work with rocks and start a rock shop,” and so he did. After studying at Michigan State University and minoring in geology, Kevin evolved into a talented lapidary and jeweler. He opened Korner Gem over 20 years ago. Kevin is known for combining Petoskey stones with indigenous stones and/ or gems in the same piece. Two of his favorites are Leland Blue and Frankfort Green, which are actually slags, a glassy byproduct left over from the smelting of iron ore. His most famous combination is his Unity Collection: Petoskey stone and Leland blue. View Kevin’s work, including the Unity necklace. Kevin also loves to create unusual pieces in which he takes a Petoskey stone a couple has found and butterflies it, creating two mirror-image pieces that can be used in wedding rings, for example. 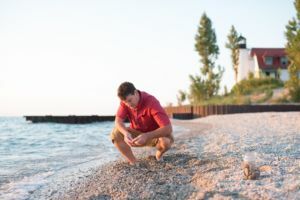 Kevin has fun not only creating and designing his new pieces, but also walking the beaches, as he did as a boy, looking for Lake Michigan’s stones and gems—in addition to Petoskey stones. I ask him to take me to a rock-hound beach, and he obliges. Walking along the sand, he stops, bends down, and picks up a piece of unikite with its pink and green lines, and then shows me its color when wet. He crouches down for a pudding stone, with its red, white and black stones cemented together with quartz. Kevin is also particularly fond of stripes on stones. “It’s all about the quality; it doesn’t matter about the size,” he says. He hands me all the stones he finds, and I keep them to remember this time. The wave action in Lake Michigan is like a giant stone tumbler, and he can find about 30 indigenous stones that he uses in his jewelry creations. Kevin learned so much about rocks that he wrote multiple books, including, Lake Michigan’s Rock Picker’s Guide, so you too can find your own Petoskeys and other stones. Kevin claims that the Great Lakes have more color and variety of stones than anywhere on the planet—jasper, feldspar, quartz, agates, to name a few. 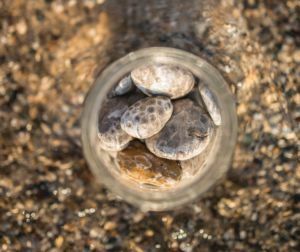 By mid-summer, popular beaches can be picked over for Petoskey stones, but the stones resurface after big storms. Kevin has also had luck at excavation sites, like where a new basement is being dug. Sometimes you find them in storm drains and wash outs, he says. Walking the beaches and searching, head down, focusing hard, is like a kid on a treasure hunt. 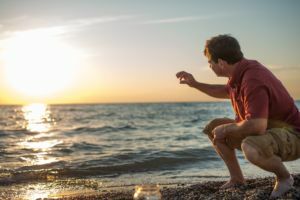 These days, Kevin loves to create joy in children’s lives by “planting” some of his lower quality Petoskey stones on the lakeshore when folks are walking by and searching for them. He sits back in the sand, and just watches the delight as they find them. The little stone has the capability of evoking wonderful memories in so many people. “It’s Christmas every day on the beach here,” Kevin says. “You never know what you will get—each day is something different.” And with luck it will include a Petoskey stone. 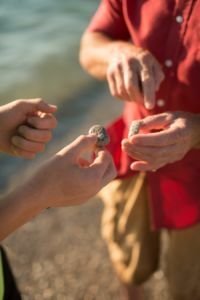 Try Kevin’s 10 Tips to Find More Petoskey Stones! Find a world of Petoskey stones, gems, minerals and jewelry made from all the above (custom orders encouraged) at Kevin Gauthier’s Korner Gem. 231.929.9175, kornergemstudio@gmail.com.